As of Chrome 58 SSL certificates must have a “Subject Alternative Name” (SAN) field, “Common Name” (CN) is not sufficient anymore. This breaks many self signed certificates on dev machines. This will generate a temporary OpenSSL config file with subject alternative name for example.com (adjust accordingly). This will generate example.key and example.crt. Copy these into the appropriate location for your web server and restart the web server. This step makes it unnecessary to import the certificate in Chrome. Chrome will trust certificates from the user cert db. Just closing the browser window might not be sufficient. Make sure that there are no remaining Chrome instances. 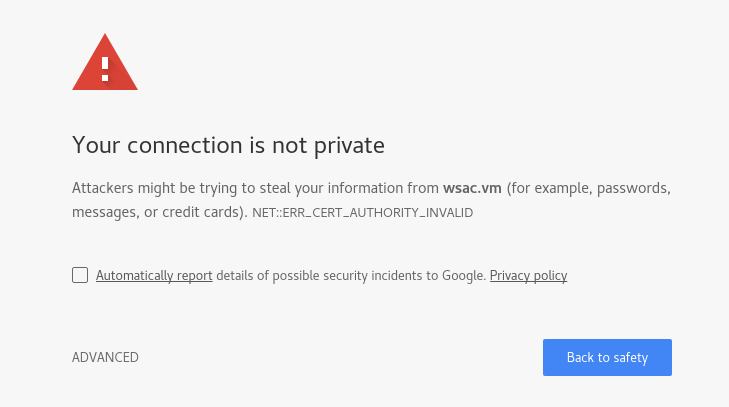 An alternative quick and dirty workaround is to start Chrome with the –ignore-certificate-errors command line switch.